For the fifth time, MUCC completed yet another successful Chainsaw Safety Training this past weekend (March 30th & 31st). The event was at full attendance with twenty-five individuals and five instructors. The Heavy Equipment Response Coalition, a non-profit organization, voluntarily helped run the course. Scott Peterson, a private business owner who specializes in teaching and handling chainsaws, was hired on to help instruct the event. 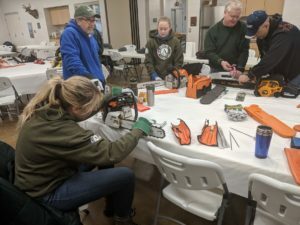 He shared all-around information on chainsaws, chainsaw safety and demonstrated hands-on chainsaw maintenance and cuts. Bill Dawson and Bill Rushford, of the Heavy Equipment Response Coalition, where along for the ride all weekend providing PPE, tools, and chainsaws for attendees to use. They were very engaged in helping attendees, sharing their chainsaw knowledge and providing guidance to novice sawyers. Sarah Topp (Huron Pines AmeriCorps Coordinator) and MUCC’s own Shaun Mckeon, where also in attendance all weekend assisting with the event. One more keynote to mention, five Huron Pines AmeriCorps (HPA) members were in attendance, including myself. The class took place from 8am-5pm both Saturday and Sunday at the Rose Lake Shooting center here in Lansing, MI. Day one of the training was in the classroom, at the Hal & Jean Glassen Building within the range. Scott walked the class through PowerPoint slides that provided necessary information on chainsaws. 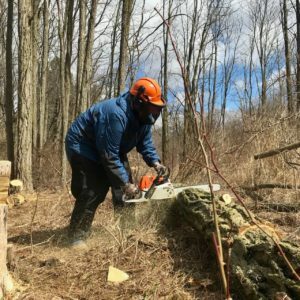 Before you handle a chainsaw, it is imperative that you learn how to safely handle it and maintain it. Coming into this training, I personally had never handled a chainsaw nor did I know how to maintain one either. By the end of the day, we were watching Scott show us how to disassemble a chainsaw and inspect its parts. From there, he showed us how to sharpen and maintain the bar and chain. We were ready to head out in the field the next day. For day two, we started out in the classroom, working on chainsaw maintenance. If you did not bring your own chainsaw, then one of the instructors was happy to provide one for use. 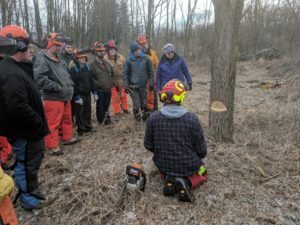 Once the chainsaws and sharpening tools were out, the class was divided up in groups based off of experience. Myself, the other HPA members, and several others were in the novice group. An hour in and we had cleaned and sharpened all the chainsaws that were to be used in the field that day. Prior to the event, Shaun and I had met up with Chad Krumnauer (Rose Lake Wildlife Technician) to survey an appropriate area to use for the class. He picked a lot within the Rose Lake State Game Area that was pretty overrun by black locust trees. Once the locust trees are cut, MUCC can then use the branches and trunks of the trees for a future OTG Jr. project to build rabbit habitat. Divided into our groups, we set off to the designated lot to put our new chainsaw knowledge to actual use. 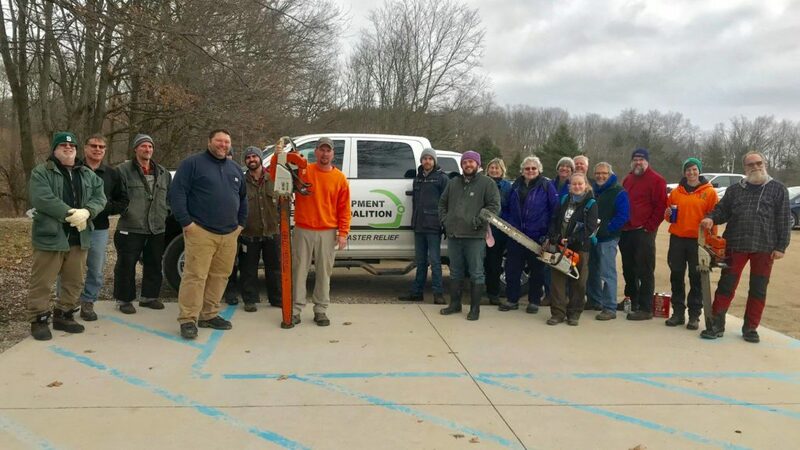 The novice group lead by Sarah and Shaun started off bucking a fallen tree to get familiar with the feel of the chainsaw. We then graduated to liming trees and cutting notches into stumps. I personally was able to cut down my first tree, with the help of Bill Rushford. By the end of the class, all groups were able to accomplish what they needed from the training course, both in the field and in the classroom. This is currently an annual event; but because of the high demand for the course, we may be offering another in the fall. Be on the lookout for more potential chainsaw training classes, on our website and Facebook page.